I got a call to finish up a job that had been sitting for about a year. The job supposedly had a "rough inspection". At first glance all that the job needed was a 2" riser run out of the meter base, an extra ground rod, and some minor "tidying" up of the service wires. All the light fixtures were already hung,outlet put in and breakers put in the panel. That's where it all started down hill. I noticed there were no AFCI breakers in the panel, so I started to ohm out the panel thinking I would see what was what. My tester started reading a direct short on all the circuits. I at first thought maybe my tester was reading through the light bulbs. I then thought I better pull out one of the outlets to see what kind of job the first electrician had done. There was a light switch right next to the panel and a receptacle. I pulled the light switch out, and WOW, I couldn't believe what I was seeing. The neutrals were tied together with a "pigtail", and the pigtail was connected to one side of the switch, and the hot wire was connected to the other side. That's where it all started, well almost. I guess the first clue was when I pulled out the wash machine outlet and saw the wires were not tight. I then pulled out the receptacle outlet at the panel, an another WOW and double WOW. This guy had the hot and neutral connected on the same side of the receptacle. I couldn't believe what I was seeing again. I then went to the back part of the house and pulled out another receptacle, and just as I suspected, the black and white wire were on the same side of the receptacle there also. To make a very long story shorter, all the outlets in the house were wired like this. I once ran into construction power equipment which had been rewired by a grade school drop-out. So it was necessary to re-wire every connection he'd touched. Every now and then you'll read of some victim of this kind of thinking. About three years ago some non-electrician rewired the cord-cap to a power drill -- black as ground, of course. The fella fired it up while standing in a puddle -- and services were held shortly thereafter. I rather suspect that some of those walls will need to be opened up. The more you scare the inspector the more you may have to display. Anyone who is so far off the rule book is most unlikely to strap properly. I'd want to meg every run -- what damage lies underneath. While I share your amazement that anyone couls bollux things up so thoroughly, I think your experience really illustrates two 'administrative' issues far better than the technical ones. "Just finish up." Or any variation of the request. Presented in such an easy, reassuring, innocent manner. Balderdash. The guy knew sonething was seriously FUBAR, and has already tried to sort things out himself. Or, there was a conflict, and someone decided to make a few surprises on purpose. This is both your time to shine - and to make sure you're not being cheated. Remember- you're the guy who will be getting the call-backs for the next year, and every new fault found will be seen as proof of your incompetence ("You should have found it before"). The second relates to inspections. As far as I'm concerned, an inspection is nothing but a billing point. I'm sorry, but I've been through enough inspections to appreciate just how limited they are. In terms of things actually performing, or being safe, inspections are irrellevant. The best that can happen is for the inspector to be sent on a crusade against such an incompetent hack. I agree that permits and inspections are just like speeding tickets any more. Nothing about safety; it is all about revenue generation on tight budgets. It is not uncommon for inspectors around here to get 30 jobs per day to inspect, which just can't be done. They try, but there's only so much time in the day. As for topping this story, I really can't. About the worse that I've seen as far as an entire house is concerned is one that I encountered about 25 years ago. The house was long-since finished, but probably never saw any kind of inspection. My suspicion is that the house was built by the homeowner over a long period of time. He probably kept the permits (if any) active for so long by just renewing them. After a while, it probably got to where the same inspector never came there twice, so nobody knew what had and hadn't truly been inspected. In this case, the guy wired it with 12/4 BX everywhere. I'd say he was probably a maintenance man who "found" the cable at work. Anyway, not one single box used included BX clamps, in fact some had no clamps at all. There were red neutrals, white hots and barely any form of grounding. The panel was three-phase with every third space skipped (that is actually why I was called out there). There was no fixing this mess, since even most of the boxes were going to have to be changed. Some single gang boxes had as many as four 12/4 cables in them. I left there shaking my head. From what I overheard, there was serious discussion about taking the whole house down since the electrical work was just the tip of the iceberg. Now I've seen plenty of Harry Homeowner basement finishing jobs. Perhaps the worst one I ever saw was wired 100% with 18/2 zip cord. For receptacles and switches, there were no boxes; just surface-mounted wiring devices. 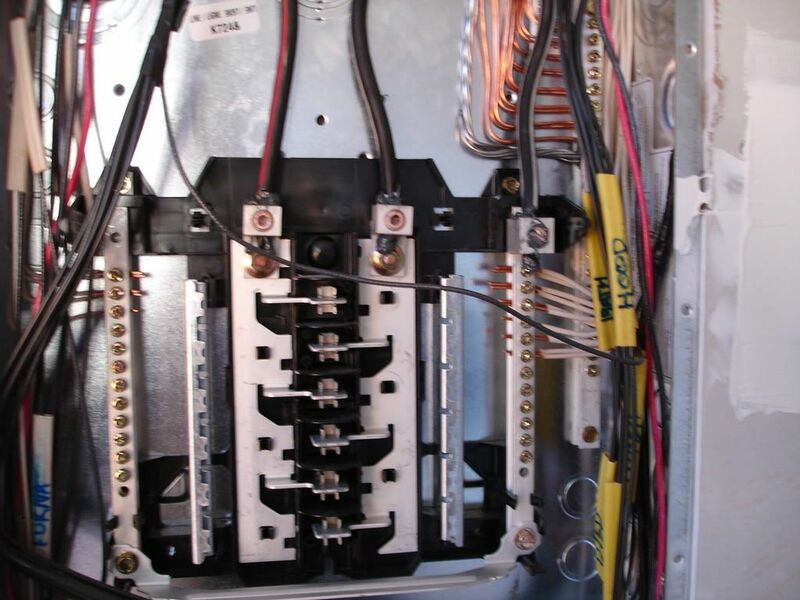 The feed for roughly 30 receptacles and light fixtures was tied into the disconnect switch for the oil burner. The reason I was even there was because the new homeowners were surprised that when they shut off power to the boiler, the entire basement went off. The "electrician" even used this same wire for speakers and you guessed it: One wire hanging out of the wall for a speaker was live with 120 volts! The homeowner said he expected that this was going to be an expensive fix based upon what he had seen upstairs with the plumbing. His anticipation of a $500.00 cost was hardly enough to scratch the surface! I refuse to say they try to meet minimum code. As far as I'm concerned, an inspection is nothing but a billing point. I'm sorry, but I've been through enough inspections to appreciate just how limited they are. In terms of things actually performing, or being safe, inspections are irrellevant. Each inspector is different, just as electricians are. To paint all inspectors with such a broad brush is, IMO unfair. Some are just better and more conscientious than others. It's the same as stating "all electricians are hacks, they're all a bunch of ripoffs". This is a tough point to get across ... but I am not trying to infer anything improper on the part of the inspector, or system with that comment. It's simply that no 'quality control' mechanism, even in a factory, can examine every detail without shutting everything down. Since the very purpose of production is to accomplish something, a 'shut down' is out of the question. There is no substitute for the guy doing the work being competent and caring. Absent his co-operation, inspections are an exercise in futility. All any inspector can do is 'hit the high spots.' That is, check a few details in a few points, and hope the theory behind such statistical methods has not been deliberately circumvented. I don't count on the inspector to check me, to correct me, or to keep me honest. That's my job. For me, inspection is not a game where we see how much I can sneak past the guy. That's why anyone beginning a defence with 'it passed inspection' is, in my book, showing faulty logic. To me, that alone infers nothing as to the quality of the installation. Oh, I understand your point ... it's hard to compete with a $15/hr handy dandy! Yet, again, it's a bit misleading. None of us needed years of training to learn how to change ordinary light bulbs. -Several restaurants that were still suffering from years of 'third world' repairs. As most of this stuff was 'maintenance,' I generally did not need to pull a permit, and could not rely upon the laws to guarantee me a market. That's why I said that a mess like the one described above is an opportunity for a real pro to show the customer the value of having a real pro! The quality of an inspection is dependent on the quality of the person performing it, and the experience and training (both book & field) of that person. As to quantity of inspections, 30 in one day is IMHO impossible; 16 minutes each, inclusive of travel time, based on 8 hour day. Yes, perhaps IF it was 30 hard wired appliances in one apt complex, it could happen. Revenue generation? Yes, the building depts here in NJ are supposed to be 'self sufficient', using permit fees for expenses, not tax dollars. 'Billing points' for the EC? Sure, I did it throughout my EC business career. Dependent on the job scope, some 'approvals' were worth 5 figure sums. Yes, there were 'Reds' that were revenue delayers also, some unwarranted, some deserved. Most if not all of us inspectors keep an 'eye' open for people who should not be doing certain things.